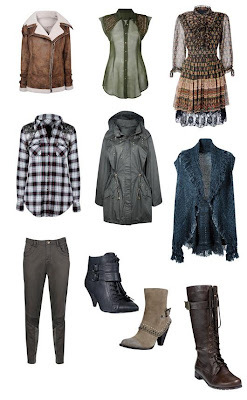 Hidden Gem: Evans A/W Collections..
Ok, so I'm a bigger fan of winter than I am of summer. I love the romance of it all, the colours and I even like the rain a little bit. But most of all I love the clothes (and not just because I look much better in clothes than I do without clothes, but that is one of the reasons!) There is so much more style around in winter, the tights, jeans, boots, jumpers (ooh I love 'em big, and soft, like my men). One reallly great example of this amazing winter style that we've seen on the cat walks is the great Evans A/W style. I think as many other fatshion bloggers have stated, one of the best lines they have ever done, so fashion forward yet purse friendly. I'll probably buy all of it. On a serious note though this is so different and fresh from anything we usually see at Evans! This is the next range from them I wanted to highlight, the Rococo range. All my christmas outfits sorted with the brocade detail on that gold dress! So in this A/W 2010. And the chunky knit, great for shopping and buying more clothes in might I add. I am also going to point out the Gold, sequin dress, but this is all for me, noone else may buy it. Also it's my christmas party dress, if any suggest fancy dress I will sit on their faces, again nobody wants that! I really hope when I go into the Evans store that these clothes match my expectations, I have been praising them all too much. Mmm grey fur, cream ruffles, and pale blue dresses with sequins baaaah. No, problem I must say I wasn't a huge fan of Evans, but I love winter/fall and they have given us some more clothing to play with!